By Eric Thomas: Making his fourth fight of his still developing career unbeaten Kevin “Kimbo Slice” Ferguson (4-0, 3 KO’s) scored a 4th round knockout on Saturday night over Brian Green (0-1) at the O’Reilly Center, in Springfield, Missouri. Slice, 38, connected with a series of hard shots that backed Green up to the ropes with only seconds to go int he fight. Slice then connected with a right-right left combination that knocked Green completely out, sending him to the canvas flat on his back where he laid staring at the ceiling unable to get to his feet. The fight was then halted at 2:57 of the found. It’s a good thing that Slice got the knockout because he looked horrible from the 2nd round on and appeared to have gassed out after the the first minute of the first round. Slice looked slow, weak and exhausted throughout the fight. He was in with a guy that he should have been able to destroy, as Green looked like someone that climbed out of the crowd to take the fight. It was pure amateur hour through the four rounds. Green was trying superman punches and looked like a poor MMA fighter trying his hands at boxing. Slice wasn’t any better and the Missouri crowd seemed to be hugely in Green’s favor, even though he comes from Iowa and not Missouri. Slice landed most of the shots in the 1st round while Green held his hands down by his sides trying to make him miss and doing a poor job. When Green did land punches, he had no power whatsoever. His power punches looked weaker than jabs and he lacked hand speed. Slice faded badly after the first round allowing Green to take control over the fight. He landed a lot of shots in the 2nd round and seemed to be playing to the crowd through much of it, smiling and enjoying it. Slice could do little more than jab in the 2nd round due to his fatigue. Ditto for the 3rd round as well. 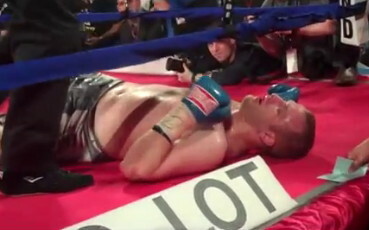 Going into the fourth round, it looked like Green was on his way to winning the fight. However, Slice caught him with a big right hand in the last seconds of the fight and added a left hook that flattened Green, knocking him completely out. Overall, it was a terrible performance by both fighters. Slice needs to hang up the gloves because he’s not going anywhere in boxing. He lacks stamina, speed, power, defense and the athleticism needed to succeed. If this was C level fighter Slice was in with last night, he would have been knocked out. The only guys that I can see Slice beating are D level fighters, and at 38, he’s too old to improve much.